I am not a Dancing with the Stars fan. 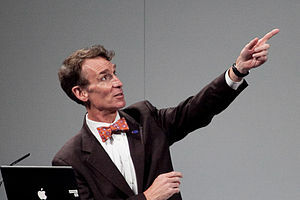 I am a HUGE Bill Nye the Science Guy fan. When I was 4 years old (1994) I wrote him a letter, he wrote a post card back and it’s still a crowning moment of my life. I am still a PBS kid, so any opportunity that I can get to watch him on TV I’ll take. Usually it is reruns of Bill Nye The Science Guy or on YouTube but hey new stuff is cool too. So I have picked up this show, well, until he’s eliminated. From what I’ve seen these judges, I think, are better than the So You Think You Can Dance judges which make a concerted effort to pick the winners from the audition week, and then manipulate the audience into picking the predetermined winners. Bill Nye is coming off as the crowd favorite, however his dancing does leave a great deal to be desired. But I think all nerds can agree that it is so amazing to see him on TV again. I have to say I’m not a huge fan of her first of Tyne’s first outfit. But that I’m sure is in the tradition of the dace. The second purple one, I think, is pretty gorgeous. So it all evens out in the end. Or this week, or this month, heck maybe this season make sure you watch this one. My personal style icons are Tina Fey and the character of Bernadette on Big Bang Theory. The first part of all of this is starts with the glasses. Tina Fey’s glasses are iconic now but Bernadette has a great pair too. Similar but different. Both are attention grabbers that really will get noticed. I wear a pair that are black wire frames with blue on the inside. They really channel Tina’s. I’ve been wearing one like both of theirs since about 2006. I’ve had glasses since 1st grade so there has to be something to make them interesting or else, I guess I could switch to contacts but I hate the idea of touching my eyes every morning and night. Sweaters. Bernadette is a master of the cardigan, Ms. Fey is more commonly seen in the pull over variety, but as Liz Lemon rocked the TGS zip up hoodie. I realize that it seems silly to mention but how often do you see women in the media wearing clothes that are meant to keep them warm and comfy without it trying to emphasize that they are slobs? Liz wore what she was comfortable in because she had about a hundred people on any day to organize and make sure they all got their work done. I think it’s awesome when a character is real. In every production house I have ever been in no one wears anything other than jeans and hoodies during the colder months. Maybe a blazer if the clients, advertizers, or executives are coming around but anything else isn’t practical in a work place where even the bosses have to do heavy lifting. Bernadette’s big, full, floral printed dresses and skirts are a staple of my wardrobe. Something that gets you noticed but isn’t too loud. Something you can wear for a walk or to the office, or out to lunch. Perfection has been achieved.